TRACKER CLASSIC — TRACKER. TRUCKS YOU CAN TRUST. SINCE 1975. Tracker Trucks have a 2.59" hanger and a 5.35" axle. Tracker skateboard trucks are known for being some of the lightest-weight trucks on the market. 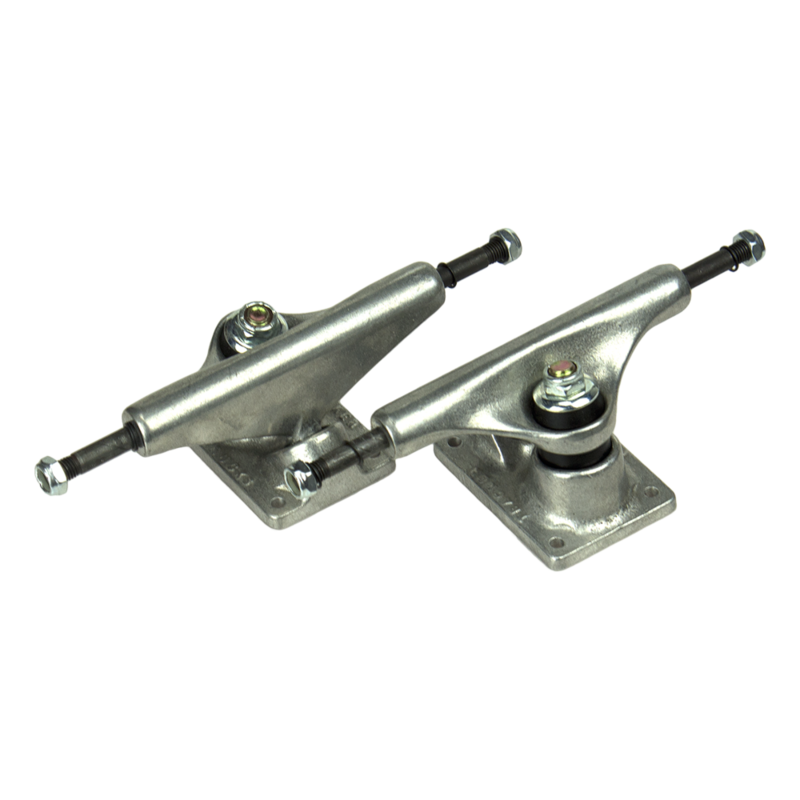 Tracker Trucks 66mm Halftrack Polished Skateboard Trucks - 2.59" Hanger 5.35" Axle (Set of 2) guarantees a stellar ride. The 85 mm Midtrack size is favorite for old school cruising style setups as well as retro uber-tight slalom setups. Polished finish with factory stock bushings; Dart 6-hole baseplate. Tracker uses 356 T6 aircraft grade aluminum, 4140 Chromoly steel axles and grade 8 kingpins in all of their trucks. Every part of this truck was proudly hand built / inspected in the U.S.A and comes with a lifetime guarantee. If you need the quickest turning, narrowest, most reactive trucks out there, then you've come to the right place. The Tracker Fultrack 106 Skate trucks are the best trucks if you want to turn tight, carve hard, or just mount up a narrow mini board. Enjoy incredibly tight turning with the Tracker Fultrack 106 trucks! Tracker Skateboard Trucks Extrack B52 Base - Original old school Extrack Molds with a B52 base plate! Get them while they are still hot! Our Classic Tracker SixTracks are built with black upper and lower cushions. These Classic SixTracks are built to ride and, as with all Tracker Trucks, come with a full guarantee. All the classic Tracker Trucks base plates are drilled using the original old style four hole pattern, does NOT fit re-issue old school boards.